For You is the first full-length studio album by Prince, and the first Prince-related release of any kind. The album was released when Prince was 19 years old, in April 1978, receiving international release later based on his success in the years that followed. Many of the songs (For You, Soft And Wet, Just As Long As We're Together, Baby My Love Is Forever and I'm Yours) had been demoed by Prince as home recordings or early studio recordings in 1976 and 1977. These tracks were all re-recorded for the album, when In Love, Crazy You and So Blue were also recorded. The album sessions took place at Record Plant, Sausalito, CA, USA, from 1 October 1977 to 22 December 1977, before overdubs and mixing were done in early January 1978 at Sound Labs, Los Angeles, CA, USA. 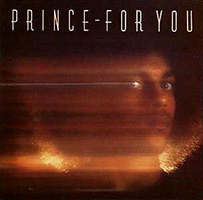 While Warner Bros. had initially given Prince a budget of $180,000 for his first three albums, the album sessions of For You accumulated $170,000 in studio bills. An early configuration of the album contains a different sequence and including the unreleased tracks Make It Through The Storm (here titled We'll Make It Through The Storm) and Amber Eyes. Some of the versions included vary in timing from the released album, and the unreleased sequence is listed below (although minor discrepancies do not necessarily indicate a different version of the song was used, and may simply reflect a difference in silence at the beginning or end of a track). Prince was credited for all vocals, songwriting, every instrument played on the album, as well as the whole arrangements and production. The only credit given to someone other than Prince is a co-writing credit to Chris Moon for the lyrics of Soft And Wet. Moon and Prince disagreed over credits due on My Love Is Forever, which was financially settled after the album release. The album would produce two singles, Soft And Wet, issued two months after the album release, and Just As Long As We're Together, released in November 1978. Prince didn't go on tour to promote the album. A band was assembled in late 1978 and played their first concerts with Prince at the Capri Theatre on 5 and 6 January 1979, but they failed to convince Warner executives that the band was ready to tour. The album reached number 163 on the US Billboard Top LP's & Tapes chart were it remained only five weeks. During the same period, the pop chart toppers were the soundtrack to blockbuster movie "Grease", Linda Rondstadt's "Living In The USA", Donna Summer's "Live And More" and Billy Joel's "52nd Street". On the Billboard Soul LP's Chart For You fared a lot better, reaching number 21. However the album could not compete with other LPs of established black artists like Brothers Johnson ("Blam"), Ashford And Simpson ("Is It Still Good For Ya"), Funkadelic ("One Nation Under A Groove"), Barry White ("The Man") and Chic ("C'est Chic"); these albums together with other very successful LPs from Donna Summer ("Live And More"), Rick James ("Come Get It") and Rose Royce ("Strikes Again") trusted the first five positions in the Soul LPs chart from August to December 1978, making it almost impossible for Prince to reach top ten. Owen Husney reported the album sold 150,000 to 200,000 copies in Trax Magazine in December 1979. All songs written by Prince except where indicated. "Special thanks to God, Owen, Britt, Bernadette, My Father and Mother, Russ Thyret, Gary, David Rivkin / Sound 80 Studios, C. Moon, Eddie, Sharon and Eleanor, L. Phillips, Bobby "Z" Rivkin, Tom Coster, Graham Lear, Joe Giannetti, Patrice Rushen, Charles Veal, Jr., Shirley Walker, Knut Koupee Music, Chuck Orr, Lisa H., and You!" US press adverts for this album. US Retail Poster for this album. An early configuration is known, containing a different sequence and alternate tracks. This is listed in the Alternative section above. Entry position 55 (22 Jul. 1978), 54 (29 Jul. 1978), 49 (5 Aug. 1978), 49 (12 Aug. 1978), 47 (19 Aug. 1978), 60 (26 Aug. 1978), 60 (2 Sep. 1978), 58 (9 Sep. 1978), 48 (16 Sep. 1978), 38 (23 Sep. 1978), 30 (30 Sep. 1978), 27 (7 Oct. 1978), 21 (14 Oct. 1978), 28 (21 Oct. 1978), 28 (28 Oct. 1978), 28 (4 Nov. 1978), 30 (11 Nov. 1978), 51 (18 Nov. 1978), 51 (25 Nov. 1978), 47 (2 Dec. 1978), 62 (9 Dec. 1978), 62 (16 Dec. 1978), Exit position: 67 (23 Dec. 1978). Entry position 190 (28 Oct. 1978), 181 (4 Nov. 1978), 173 (11 Nov. 1978), 165 (18 Nov. 1978), Exit position: 163 (25 Nov. 1978). Charts: Billboard Magazine Vol. 90 n° 29 to 51. This page was last modified on 24 November 2017, at 13:50.